This page presents two of Sea Cloud Cruises' sailing ships. These ships offer a luxury cruise experience for a small number of people. Sea Cloud is a ship with a long history whereas Sea Cloud II is a contemporary ship built in the traditional style. 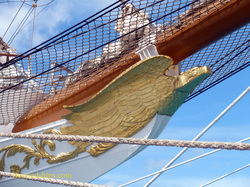 Inasmuch as this is a luxury experience, the crew handles the sails. Passengers are free to relax in the wood-paneled interior. Although Sea Cloud Cruises is based in Germany, the ships attract a mixture of American, British and German guests. Sea Cloud was built in 1931 as the yacht Hussar for financier E.F. Hutton. As part of a divorce in 1935, the ship became the property of his wife Marjorie Merriweather Post who had designed the interior. She re-named the ship Sea Cloud, and with her next husband, the diplomat J.E. Davies, entertained kings, queens and dignitaries aboard. During World War II, Sea Cloud served as a weather observation ship. After the war, she was returned to her owner. 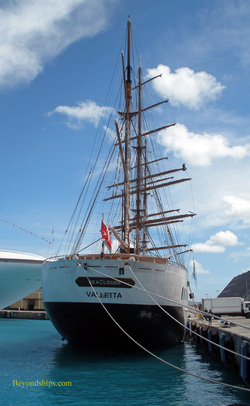 However, in 1953, she was sold and became the presidential yacht of the Dominican Republic under the name Angelita. Following the assassination of dictator Rafael Trujillo, she was sold again and went through a variety of names and owners. After being laid-up for eight years, she underwent a refurbishment in 1978 and began sailing for Sea Cloud Cruises in 1979. In November 2010, she underwent another re-fit to bring her into compliance with new SOLAS (Safety of Life at Sea) regulations. Although they look similar, Sea Cloud and Sea Cloud II are not sister ships. Sea Cloud II is a modern ship that was purpose-built in Spain for Sea Cloud Cruises.